Shore's Wound Care Center, managed by Healogics, Inc., provides specialized treatment for chronic or non-healing wounds, which are defined as sores or wounds that have not significantly improved from conventional treatments. Associated with inadequate circulation, poorly functioning veins, and immobility, non-healing wounds lead to lower quality of life and may lead to amputations. When wounds persist, a specialized approach is required for healing. At Shore's Wound Care Center, we follow treatment protocols specifically established for each type of wound. We utilize the latest approaches to wound healing and remain current in new scientific advances in wound care. Through a partnership with Healogics, Shore Medical Center is able to offer a comprehensive center offering specialized wound care. Healogics is the world’s largest wound care management company with nearly 800 hospital partners delivering excellent evidence-based care to patients with chronic wounds. 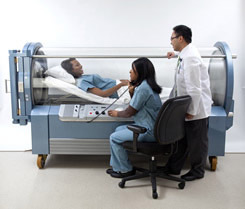 Healogics has been the leader in wound care for nearly 20 years, offering the most advanced modalities such as adjunctive hyperbaric oxygen therapy (HBOT). Of special importance to our hospital, Healogics Centers traditionally achieve excellent clinical outcomes, including high limb salvage rates, a 91% healing rate within 30 median days-to-heal, and extremely high patient satisfaction.